It is only the lapdog media which is safe in India today. Jump into and snuggle down in the lap of authority, strum the tanpura, like Narada did, and chant Narayan Narayan on the TV screen, and nobody will dare say anything to you. On June 9, 2017, Basit Malik, a reporter for Caravan magazine, went on a reporting assignment to Sonia Vihar in Delhi where there is a dispute between some Muslim and Hindu residents of the neighbourhood over a piece of land. As soon as it became known that he was a Muslim, Malik was attacked by a mob and handed over to the police, who were told a ‘Pakistani’ had been caught ‘without papers’. 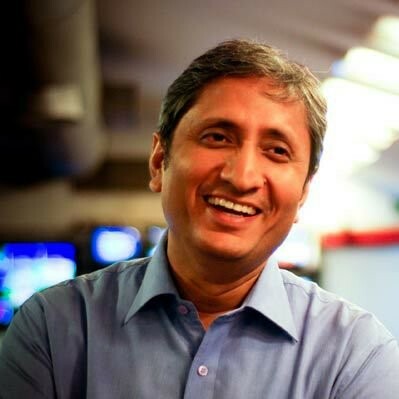 This is a translated version of excerpts of the comments made by the award-winning NDTV India news anchor Ravish Kumar at a meeting organised by the Press Club of India, Delhi on June 24, 2017 to protest the attack on Basit Malik and the climate of intolerance that is being fostered against the media. At a recent event in Delhi, the speaker of the Lok Sabha, Sumitra Mahajan, advised journalists to “be like Narada”. Do not report unpleasant truths (‘apriya satya’), she said. If you must speak to the government, then speak with a sweet tongue. This is what her published statement says. I would really like to see her original remarks. In Indian mythology, sage Narada was among the most ardent devotees of Lord Vishnu, with his constant chant of ‘Narayan Narayan’. If you want to see us as Narada, then you will have to give us at least a glimpse of the godly faces in Indra’s court. Who among them are worthy of being gods for whom we would be willing to become Narada and refrain from voicing unpleasant truths? Moreover, it is Madam Speaker who gets to decide what is or not pleasant truth. The frequency of such incidents has increased, so much so that we journalists are finding it difficult to track who is being targeted and for what. Such incidents have become commonplace. From the lane to the crossroads, there is a crowd lying in wait; it knows you by face. If it sees you doing your work as a journalist, it will start by looking at you with suspicion and then beat you senseless. It is hard to bring oneself to read Basit Malik’s detailed account, published in the Caravan. One character stands out in the account, that of a lawyer. This character is a presence in the crowd everywhere. His presence is unmistakable. It would be advisable to try and understand what exactly this character is doing in the crowd. In a way, he can be described as a ‘legal empowerment cell’ for the crowd. Three or four such incidents involving lawyers in recent times come to mind. As to the incident that took place in the precincts of Patiala House court, we are yet to get a decisive account of what really transpired there. An army of lawyers is being thrust forward to perpetrate such events. In Uttar Pradesh, it took two days for senior police officers who were attacked to speak up. The National Project for Instilling Fear has reached completion. Before getting new highways and jobs, everybody has been unfailingly given one thing – fear. For every individual, fear is now a daily livelihood and we are all experiencing fear in so many different ways, from the moment we step out of our homes with so many warnings ringing in our ears – be careful, look here, look there…. It is only the lapdog media which is safe in India today. Jump into and snuggle down in the lap [of authority] and nobody will dare say anything to you anywhere – lose yourself in the songs of devotion, strum the tanpura, like Narada did, and chant Narayan Narayan on the television screen. Behold our Speaker, who is seen as occupying the strongest seat of democracy – these are her very thoughts. Think about what Asad Ashraf and Anupam Pandey had to endure in Rajasthan. The policeman who said, ‘I will beat you and degrade you even if it means getting suspended from my job’, is emboldened because he knows the authority that manages the National Project for Instilling Fear is his political lord and master. The way news channels are going, the time is not far away when we will forget the real republic and recognise India only through the news channel, saying, this is our India. It’s just a matter of perhaps a week or 10 days before that project too is accomplished. Soon they will field their own candidates and win with an 80% vote as well. I am seeing India turn into a mobocracy – a mobocracy made up of those who are our very own. There are many with whom we share ties of blood who happen to be part of the mobocracy that kills by lathi blows or abuses whoever it wants. Let me tell you about an incident about a friend who was travelling by train with his mother. A woman of conservative views, she was wearing a burqa. A mob formed instantaneously, spewing taunts at them throughout the duration of the journey. Their self-confidence was extinguished in the first couple of hours itself. Feel free to conduct a survey on what food train passengers who happen to be Muslim carry with them. Since they are traumatised by the fear that somebody will check their food, they reason, let us not keep anything nice – anything nice such as even egg curry. In this entire project for instilling fear, which they have successfully implemented, we comprise the smallest and the most vulnerable units. Now the project has reached the newsroom too. As to how the situation can improve, I have no idea. Maybe we can create a helpline for those who have been beaten up and those who have died. Newsrooms have taken to the Narada syndrome in an easy and unaffected manner. In fact, Narada ji has become the biggest icon of present-day journalism. What’s more, we have no idea of when that happened. Now it is the turn of many of our comrades who are practicing alternative journalism, to be the target – those who are running small websites with a handful of journalists. These are websites that boast maybe a lakh or two or five lakh hits. When all mainstream voices are muzzled, it is these websites which report incidents. Somebody somewhere shares the report and it reaches somebody somewhere else. These journalists too are going to be beaten senseless; people will target them. All this is happening systematically as part of the political gameplan, make no mistake. Many of their local political agents who play the role of vendors, ‘feeding’ through WhatsApp, are now in the killing business as well. Gathering 10 men to kill someone with lathi blows used to take time. Here [in Basit Malik’s case] it would have taken no time to assemble a crowd because they have the perfect apparatus, courtesy of WhatsApp. This means field reporting too is out for us. I speak from experience; in the days following demonetisation, it became very difficult to go anywhere for field reporting. You are not going to go with SPG cover, right? SPG cover is provided to those who don’t go anywhere! You have provided full security to those who will never go anywhere. Under these circumstances, where is one to go and, in the minimum time, accomplish the task of speaking to as many people as possible? It is to arrive at this situation that they have prepared themselves thoroughly. Now it is up to us to find a way of dealing with this fear. The nationalisation of fear that has happened is unprecedented. In a country where every other man is incessantly on the phone, tell the person on the other end that your phone is being tapped and notice how swiftly he hangs up. Now he starts by asking, are you sure your phone is not being tapped? Have it your way, tap away to your heart’s content and broadcast to the nation who all I speak with and what I discuss. Do it with everybody if it suits your purpose. To merely say this is a dangerous situation is not enough. I was reluctant to use the comparison, although many did make that comparison with Hitler. I may not have spotted a Hitler but let me tell you that Goebbels has made a grand entrance into your profession. He is not visible as yet, but he is there and has commenced his work. It is entirely Goebbels’ handiwork that a certain television channel runs a campaign through the night about a seven-year-old matter. For the last three years I myself have been at my wits end and keep saying, don’t watch, stop watching television. It is necessary to tell people, ‘What you are watching is garbage!’ You are not being readied to kill Muslims. One day you will be used to kill just about anybody. When the rumour of a child-lifting gang spread like wildfire through Jharkhand, Uttam and Gangesh were also killed alongside Naeem and Haleem. In Greater Noida, Bhoop Singh and Jabar Singh were travelling with their cows when accosted. They were reduced to pleading, please don’t kill me, I am not a Muslim. Convert every person in the crowd to a possible killer – this too is a project. Managing a crowd is quite easy. Nobody owns the crowd; on the contrary, the crowd owns a government everywhere. It has its own government, it has people supporting it. We are not just fighting against the muzzling of debate so essential to a democracy. Our problem is that very soon we will not be able to step out even in our neighbourhood. They have been thorough in their preparation. You may think a person who is a well-known face is at greater risk. Is Basit Malik a well-known face? As long as they were confused by the name Malik, the situation was somewhat under control, but the moment they catch a glimpse of Urdu they will say, this is a Pakistani language. We have reached a stage where at the mere sight of the Urdu script written somewhere, we will start thrashing it on the ground that it is a ‘Pakistani’ language. The fact that many people have not come out in support is cause for concern. Many among us do not respond to incidents like this. They are journalists too. Their lack of response makes us feel that there is a pact of silence about incidents such as these. I often find myself in the midst of many such journalists and I am yet to see them betray any unease, any restlessness. It is a warning sign when even an assault on a colleague leaves you unmoved, for it means that even this basic spirit of collaboration is lost to us. The time has come to publish a weekly calendar of events. At present we are confined to holding protest meetings. Very soon, we will have occasion to see each other at condolence meetings. Ravish Kumar is an anchor with NDTV India. Translated from the Hindi original by Chitra Padmanabhan.